Brakes (and braking) aren’t necessarily the first thing you think of when Aaron Gwin’s name comes up. The reigning World Cup downhill overall champion earns his paycheck staying off the brakes, not grabbing them. But even the fastest descenders have to slow down once in a while. That’s why in 2016, when Gwin and brake maker TRP first started working together, the dominant pro wanted to create a brake to match his unique needs. A season long development process ensued, eventually netting the TRP G-Spec (as in Gwin) Quadiem hydraulic disc brakes that Mtbr tested here. Oversized cooling fins on the calipers create more surface area, helping dissipate heat more efficiently. “We basically gave him a blank slate and said let’s build the best brakes for you,” explained TRP’s Cody Phillips when the brakes first launched. That meant creating a new lever blade that’s longer, flatter, and taller, while also delivering better leverage and tactile feel. TRP also added detents to the reach adjust, tightened pad tolerances, and added cooling fins to the caliper to create more surface area, thus dissipating heat more efficiently. “We also use ceramic pistons, which dropped about 30 grams,” added Phillips of a process he says required 10 prototypes before the final production model was nailed down. 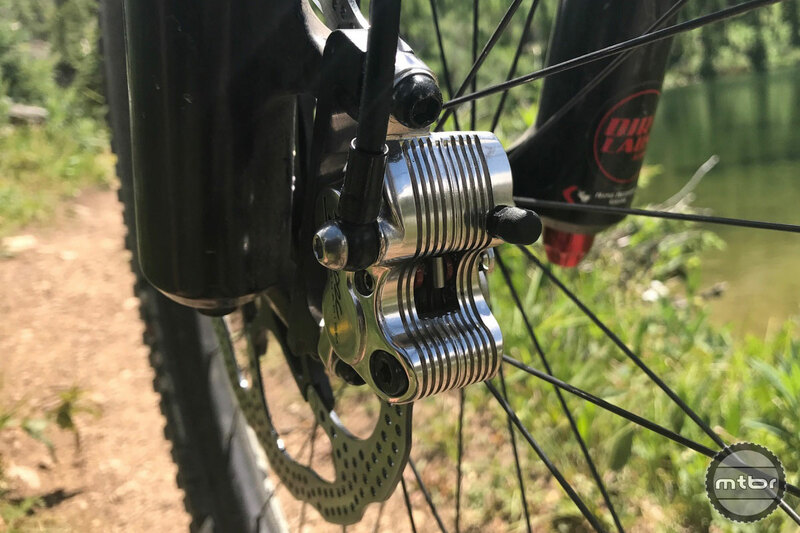 Top line features of these flashy four-piston stoppers include the hybrid ceramic-steel CNC’d caliper with cooling fins, tool-free indexed reach adjustment, a split hinge handlebar clamp, and an adjustable banjo fitting that eases hose routing headaches. The forged aluminum has also been polished and anodized, giving the brakes an eye-catching look-at-me finish. And at Gwin’s specific request, brake levers are dimpled, providing better grip and tactile feel. Rotors are sold separately for $30-$60 in all standard sizes for six-bolt and centerlock. The set-up is compatible with Shimano I-Spec and SRAM Matchmaker shift levers. Claimed weight is 312g front, though this Mtbr test set came in at 320g front, 340g rear. (If you want something lighter but less powerful, check out TRP’s G-Spec Slate brakes.) Price for the G-Spec Quadiem is $200 per brake (or $400 for the set). Rotors are sold separately for $30-$60 in all standard sizes for six-bolt and centerlock. 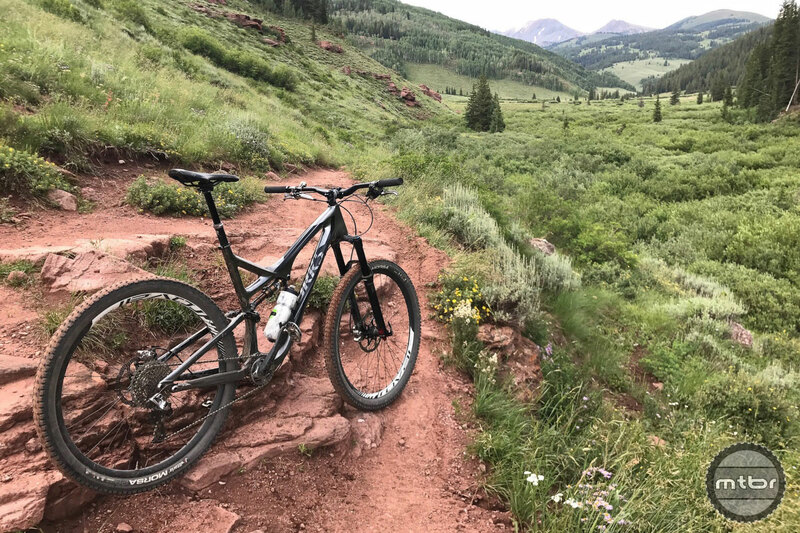 We ran our test set on this equally flashy Specialized S-Works Stumpjumper EVO, and while it’s a lot of brake for a trail bike, that thought never crossed our mind on long descents. Power is rarely the question when it comes to four-piston mountain bike brakes. It’s how that power is doled out that truly counts. Do your brakes turn on and off like a light switch? 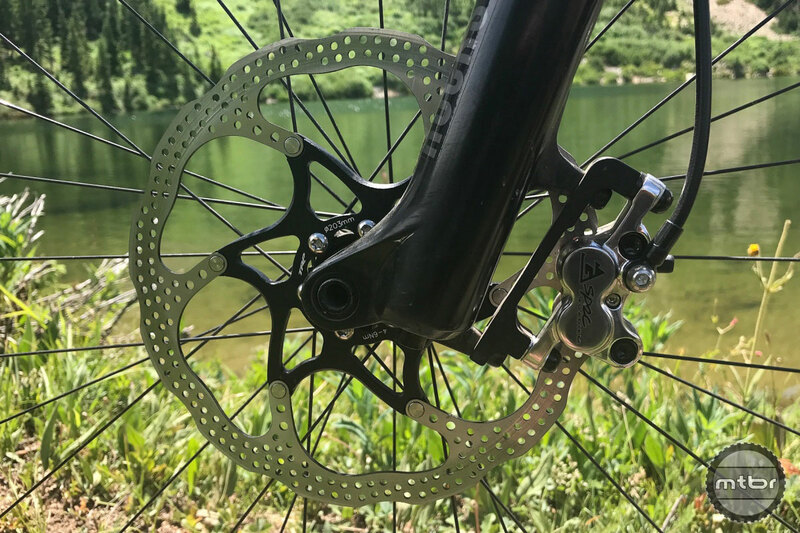 Or do they predictably modulate, preventing your wheels from locking up and instead help you maintain control and carry more speed later into turns, chunder, or whatever else comes your way. TRP’s G-Spec Quadiem brakes fall firmly in the latter category. 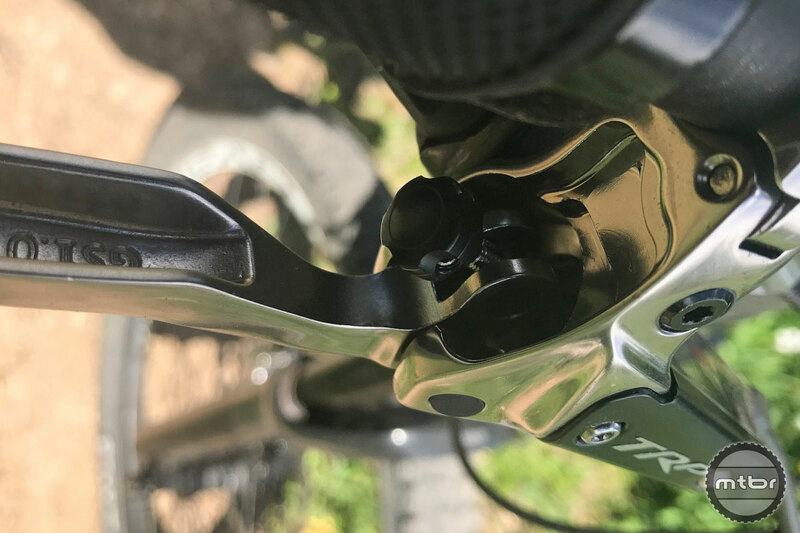 Intended primarily for downhill and all-mountain use, these powerful stoppers activate gradually, but are always ready to quickly scrub speed and don’t pump up even on long, steep descents. 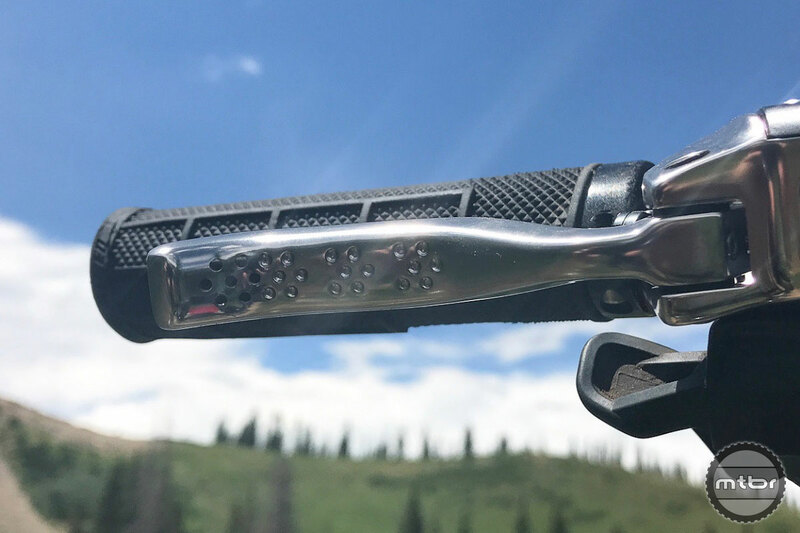 Traction holes on the lever blades help maintain hand hold in rowdy terrain. Yes, they’re a bit of a statement with their high-shine look, oversized cooling-fin equipped calipers, and long moto-style levers. But who really cares what your brakes look like as long as they do what they’re told when your bombing a many-minute downhill. 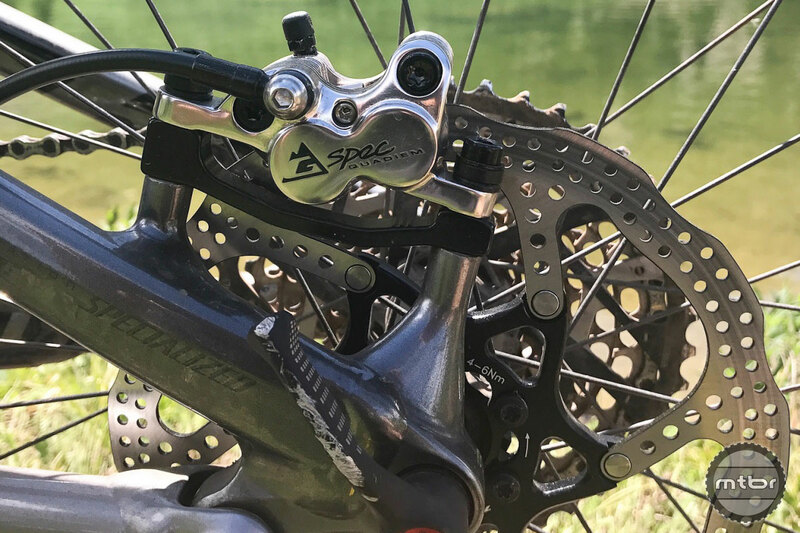 And despite what looks like an extra girthy set-up, weight is not out of line for a set-up of this genre, coming in roughly 15g heavier per brake than Shimano Saints. Reach is adjustable sans tools. 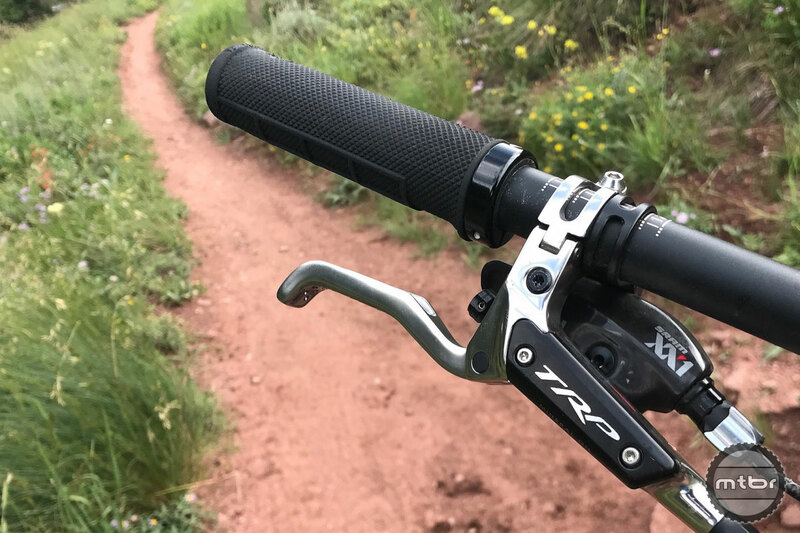 The levers have a similar shape to SRAM’s Guide, but with a more distinct curve at the end to help position finger(s) in the sweet spot. Traction holes on the lever blades further aid in hand positioning, while detents on the knurled reach adjuster knob mean it won’t back out. And the split clamp hinge bolts onto bars easily, and also plays nice with shifters from SRAM and Shimano. Bleeding is also a straight forward affair. Remove the bleed plug, screw a quick-connect hose into the lever, then push fluid through the housing using a standard syringe. The forged aluminum is polished and anodized, giving the brakes an eye-catching look. Heat is well managed by the large cooling fins along with steel pistons that have ceramic inserts. 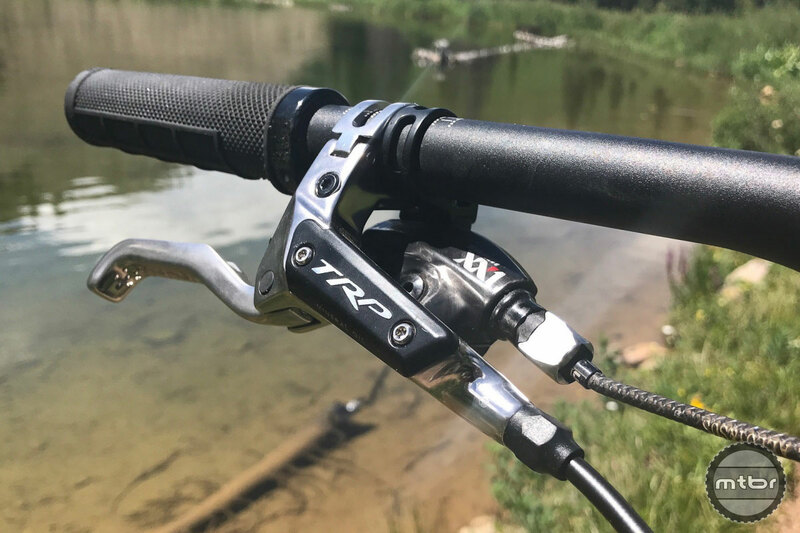 It’s also helpful that they’re compatible with Shimano Saint brake pads just in case your shop or on-line retailer of choice does not stock the TRP sintered pads that come stock with the brakes. The highly hooked lever shape keeps fingers in the sweet spot. Bottom line, the smooth lever throw, gentle initial bite, superb overall control and modulation, and ample end power make the TRP G-Spec Quadiem a solid aftermarket option for anyone seeking top-line braking performance.